Émile Durkheim (1858–1917) is considered one of the most influential figures in the founding of modern sociology. Born in the eastern part of France, Durkheim descended from a long line of rabbis and trained to follow in their footsteps. As a young man, he turned away from organized religion and became an agnostic. While studying in Germany, he became convinced of the value of using scientific methods, properly modified, in the study of human behavior. Recognized as a promising scholar, Durkheim wrote several important works on the methods of sociology, the division of labor, the scientific study of religion, and how imbalances in the relations between self and society can lead to death. One of Durkheim's most influential books is a detailed study of suicide. When it was published in 1897, Le Suicide not only changed the way in which suicide was understood, it fundamentally transformed the way sociological research was subsequently conducted. In that work, Durkheim created what became the standard structure for sociological research. On the first page of the book's introduction, he began defining the central term under discussion and proceeded to sketch out the tentative outlines of an explanation for suicide that would be informed by social science, replete with tables of suicide statistics. In critically reviewing the existing suicide literature, which largely viewed acts of self-destruction as having physiological or psychological origins, Durkheim wondered why people from similar genetic origins did not have similar rates of suicide. Why did rates vary within one region over time? If it was related to weakness of character, why was it unrelated to levels of alcoholism? Utilizing logic and statistics, Durkheim challenged both popular and academic explanations. In doing so, he indicated that the tentative sociological approach he had begun to develop in the book's introduction offered greater explanatory power. The majority of the book lays out what became a classic sociological explanation for suicide. There are four major types, all related to group cohesion or solidarity. Egoistic suicide, Durkheim argued, was most common among groups of individuals with few connections to social groupings of any kind. Thus, loosely bound liberal Protestant groups had higher suicide rates than Catholics and Jews, for whom regular religious participation was expected; married people committed suicide at lower rates than singles; and nations undergoing political crises experienced lower rates because competing interests and parties became tightly integrated under stress. Training given to workers on suicide hotlines in the twenty-first century is largely based on the conclusions and categories originally introduced by Émile Durkheim in 1897.
that certain types of suicide occurred among tightly knit groups when they came under severe threat and their members were prepared to die in the group's defense. Because suicide was widely understood as the act of sick or disturbed individuals, Durkheim's argument that soldiers who knowingly gave up their lives for their country were committing suicide appeared to diminish the valor of those actions. 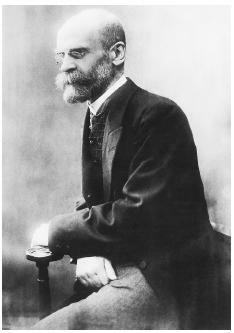 Durkheim delineated three types of altruistic suicide, based largely on a group's expectations that its members would undertake self-destruction in its defense. The third type of suicide, anomic, was identified with an abrupt shift in an individual's circumstances, shifts that removed him or her from membership in what had been a well-integrated group. Durkheim showed that nations where divorce was common experienced higher suicide rates than nations where the practice was illegal. Similarly, economic crisis could lead to personal crises for individuals who once thought of themselves as important providers for their families, but when confronted with persisting unemployment found themselves evicted from their homes, their credit rejected, and prospects for improvement dim. If these individuals and their friends were accustomed to thinking of poor people as responsible for their circumstances, then they found themselves condemned by their own categories of thought. Faced with humiliation and a lack of connection with groups who might ease their self-doubts, such individuals might commit anomic suicide. Durkheim's final category of suicide, fatalistic, is relegated to a footnote. This type of suicide occurred within tightly knit groups whose members sought, but could not attain, escape, whose "futures are pitilessly blocked and passions violently choked by oppressive discipline" (Durkheim 1951, p. 276). Prisoners of war or slaves who were bound into distinct groups dominated by other groups might commit suicide in order to escape group membership or to demonstrate control over their lives. Suicide concludes by moving from what had been a taxonomy of suicide types toward an explanation of how social, political, and economic forces produced those types. For instance, Durkheim explored links between suicide and urbanization, developing how cities atomize individuals, producing egoistic suicides. Sociologists admire Durkheim's book for a variety of reasons. Not only does the work present a clear understanding of what a sociological perspective was and how it differed from the perspectives offered by other emerging academic disciplines, it provides a clear and well-documented argument advocating the practical value of that discipline's perspective. Durkheim's reliance on statistics for calculating and comparing suicide rates was innovative for the time, as was his realization that the effects of some variables had to be controlled. Although he recognized problems in the comparability of data drawn from different regions or within one region in different periods, his work contributed to an emerging body of scholarship in comparative historical sociology. Several sociological studies have been conducted in the century since Suicide 's original publication, and while some have qualified Durkheim's observations, none has seriously challenged his overall approach or conclusions. While his earlier work contains some optimism about the potentially liberating effects of industrialization and urbanization, it also reveals concerns for disruptions caused by change that occurs too rapidly. As time went on, Durkheim saw these strains become more frequent and troubling. The Dreyfus affair led him to doubt the hearts and consciences of the French citizenry, and the outbreak of World War I revealed how destructive the potentially liberating forces of industrialization can be. The war claimed the life of his only son and intellectual heir in late 1915, a blow from which Durkheim never recovered. He died in 1917, his writing having shifted from scientific objectivity to the study of ethics. Coser, Lewis A. Masters of Sociological Thought. New York: Harcourt, Brace, 1977. Durkheim, Émile. Suicide. New York: Free Press, 1951. Giddens, Anthony, ed. Émile Durkheim: Selected Writings. London: Cambridge University Press, 1972. Lukes, Steven. Émile Durkheim, His Life and Work: A Historical and Critical Study. Palo Alto, CA: Stanford University Press, 1985. The article above is very good, but I wanted to find out what did Emile find out after his study of "the division of labor, the scientific study of religion, and how imbalances in the relations between self and society can lead to death"? Can you reply to me ASAP please.